The use of light and color to promote a specific emotional response dates back to the Egyptians who built healing temples of light over four thousand years ago. 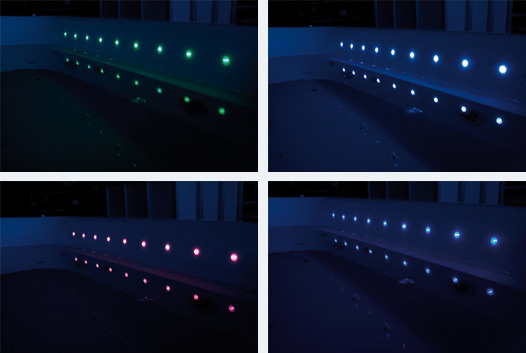 Now you can create your ideal environment with low energy consumption LED lighting designed specifically for the bath. Change your color and change your mood with one touch and delight in the colors of the rainbow. Enjoy the glow of a beautiful sunrise, benefit from the colors of a soothing reflecting pool, or bask in the warm glow of a sunny afternoon. Choose a Chromatherapy accompaniment from our Mood Beams programs to transform your bath into an exclusive retreat. Ten dramatic lighting effects provided by low energy consumption, long life LEDs create a spa in your bath. Stimulate the senses for an indulgent experience and total renewal. Please click on one of the images below to view our Chromatherapy collections.